I don’t get much mail at all if you don’t count the bills, so imagine my surprise when I found a small envelope addressed to me from the mayor’s office which contained this invitation. I’m invited, and now so are you. There will be free food, apparently, which to my student brain is one of the most important prerequisites. From what I’ve heard, some local artists have been invited as well. 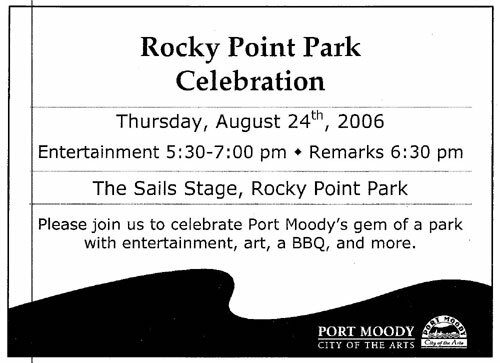 If you’re going to be anywhere near Port Moody next Thursday you might want to wander down there and check it out. If you can’t make it, don’t despair. Rocky Point is a nice spot on pretty much any other day too. Given that I live, oh, two blocks from this park, I think I will drop by!